From the moment you plan your vacation at Minneriya, one of the most popular national parks in Sri Lanka; we assure you no disappointment. The park which is located in the North Central province of Sri Lanka, is among the best three national parks in Sri Lanka. With an area of 8890 hectares, the park is abundant in endemic wild life species and flora and fauna. Minneriya National Park was established in 1997 and is transformed in to an exquisite and an ideal wild life tourist destination. The park offers tourists a change of scenery as soon as you enter the territory. The shrubby areas and the mixed ever green forest invites all tourists to have an experience for lifetime. King Mahasen was the master mind behind the Minneriya Tank that acts as the center piece in the national park. The national park of Minneriya consists of a mixed combination of dry lands, wetlands, grass lands and chena lands which were once used for agriculture. One can capture some endemic wood types at the entrance of the park as Satinwood, Halmilla, Rosewood and Weera trees. An extraordinary diversity of wild life creatures consider the Minneriya National Park as their home since a long time. The best wild life attraction in the park is Elephants. During the season from June to October, herds and herds of Elephants are spotted at the Minneriya Tank who come searching for water. Within the park there are many species of wild life animals and creatures. In number, there are around 24 types of mammals, 09 species of amphibians, around 26 species of fish varieties, 25 species of interesting reptiles, about 75 species of butterflies and 106 bird varieties for your viewing around the park. Some of the popular mammals within the park include Elephants, Sambar deer and Leopards. 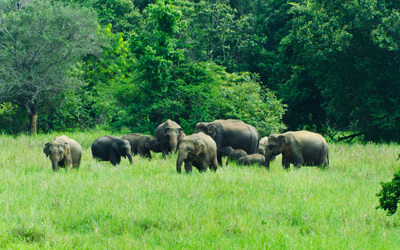 During the season between Junes to October, which is considered as the migration period from parks to parks, large numbers of Elephants are spotted together crossing borders of the popular parks of Kaudulla, Wasgamuwa and Minneriya. The local guides are aware of elephant spotting areas at any given time. Capture these momentary experience to your camera and you may even get lucky enough to capture a hunting Leopard crossing your path. What more could you see at Minneriya is beyond the explanations. The park has been an ideal sight for all nature lovers and especially for bird lovers. Minneriya is home to over 400 species of beautiful and colorant birds creating the entire area a perfect bird watching sight for anyone interested. The trees are crowded with beautiful and unseen endemic and migrant birds during seasons. Don’t let the long tongued frogs and lizards in competition to slip away from your eyes as they can only be captured by careful observing. While the frogs and lizards are abundant in the park, one could also miss the opportunity to capture some creatures as white Pelican, Painted Stork and Grey Herons. It would be affordable to lose their sight but never ever some popular wild life creatures as Sri Lankan jungle fowl, hanging parrot, brown-capped babbler and grey hornbill. Other wild life creatures that are sighted in the park include, sambar deer, macaque, sloth bear and purple-faced langur. Let your camera be the lucky one to capture wild groups of creatures of their own kind looking out for each other in danger, scheming together to hunt down a prey or innocents enjoying their day light freedom. As you choose to visit Minneriya, you have made the decision to experience one of the most essential and adventurous tours in Sri Lanka. The journey to the park and there on in to the thickness of the forest will be on a jeep. The jeep safari throughout the day would let you stop where necessary and see any wild animal in close proximity where you can make your click to remember for the rest of your life. Even though leaving the jeep would be restricted, you may enjoy the breeze and the warmth of the earth once you stop for meals. The park would be slightly hot tempered and gives you the ideal feeling of a wild life safari. Not to mention that the sanctuary of Minneriya is unlike any other. One could experience nature at its best. On your way you might need to stop the jeep a while until the elephants or herd of elephants or any other wild creature crosses your path without disturbing their routine. Let this rare life experience in Sri Lanka be one full of memories. From the commencement of your tour to the end of it, you will experience nothing but extreme excitement, thrill, adventure and entertainment. Back in your camp, feel free to relax and enjoy the traditional Sri Lankan dishes or any other culinary preferences prepared by our experienced chefs. As you enjoy dinner at an amazing atmosphere throughout, embrace the cool breeze. Enjoy your luxury tents overlooking the serenity of the surrounding. Spend the night at your tent listening to the call of the wild and leaves footprints in the morning. Your safari experience in Sri Lanka would undoubtedly be one that creates beautiful memories. Make your stay even more interesting and special by making your choice right.